Rihanna practically broke the internet and had the entire beauty world shook when she released Fenty Beauty. And for good reason. The beauty world is in for a much needed change! For years, women of color have been begging brands to be more inclusive of our needs. And for years our cries have fallen on deaf ears. Because most brands still couldn’t be bothered to expand their shade ranges past 4 shades for dark skin. Or worse. Brands would force women of color to wait for deeper shades. And then make access to those shades extremely limited. Like online only. Or the dreaded low stock options and constant sold out signs. It’s been a frustrating ride for dark skin women in the beauty world! Rihanna came out the gates blazing with an impressive 40 shades of her Pro Filt’r Soft Matte Long Wear Foundation. Fenty Beauty’s range is so inclusive that it encompasses everyone from pale women with Albinism to the deepest of Godiva chocolate drops. Yaaaas, Rihanna! Everybody wasn’t happy though. There’ were plenty brands throwing shade (no pun intended) while us dark skin divas were out celebrating the success and #BlackGirlMagic of Fenty Beauty. Brands from Make Up For Ever to Maybelline quickly jumped on the “We have dark shades too!” bandwagon. In the blink of an eye, black women, dark skin foundation and swatches on dark skin were all over social media. With Make Up For Ever and Marc Jacobs doing the absolute most. Now I love me some Make Up For Ever. And I do applaud them for being one of the select few brands with foundations darker than a paper bag. Make Up For Ever can still have a seat though. No one said Rihanna was the first to boast 40 shades of foundation. But she had them upon release. Chocolate cuties and pale princesses weren’t an afterthought for Fenty Beauty. Everyone was included from the beginning. 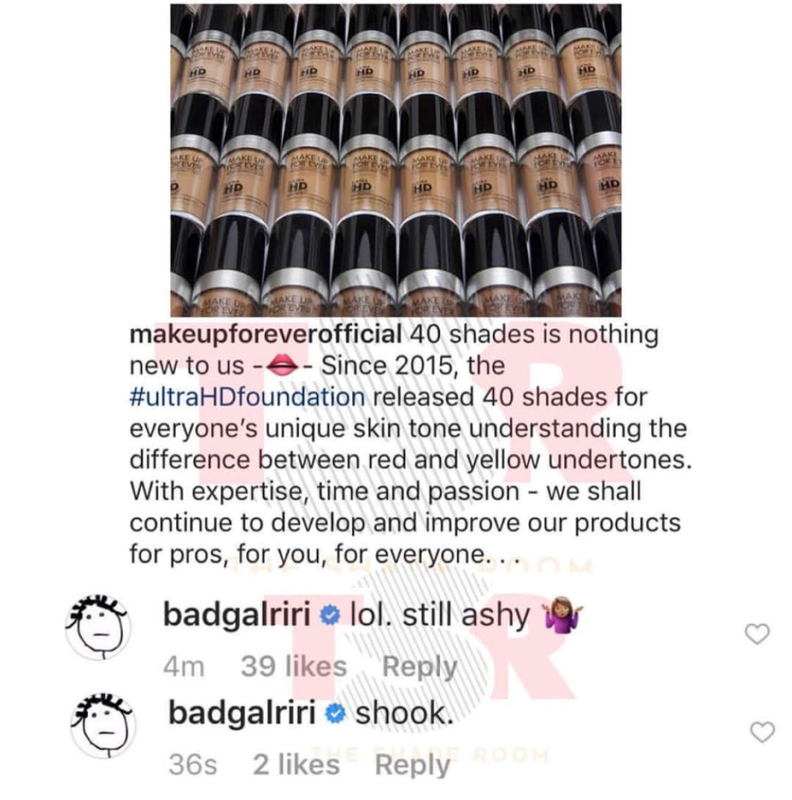 And this is why we’re all rooting for Rihanna and Fenty Beauty! And why we’re giving everyone else the side eye. Including you, Make Up For Ever. You see, Make Up For Ever has been offering shades for dark skin women. I’ll give them that. However, they’ve never marketed or advertised their dark shade offerings until recently. To put it simply, dark skin divas were still an afterthought to Make Up For Ever. It wasn’t until all of the deeper shades of Fenty Beauty’s Pro Filt’r Soft Matte Long Wear Foundation began to sell out in stores and online at Sephora that other brands decided to be “inclusive”. Even Marc Jacobs tried to slide some shade in. Which is hilariously ironic because Marc Jacobs was recently blasted for being a racist. Marc Jacobs has a nasty reputation in the beauty and fashion world for discriminating against women of color. He has consistently failed to represent women of color in his runway shows (even when they all donned dreads) and still continues to do so with his abysmal color range for Marc Beauty. So I cackled the loudest when Marc Beauty’s entire timeline went black the week of Rihanna’s Fenty Beauty launch. Literally. Marc Jacobs’ social media team went into overdrive that week because every single image on his timeline featured black women and black culture. A huge leap from the constant images of white women he’s known for. Interesting, Marc Jacobs. In the blink of an eye, damn near every brand under the sun was including black women in some way, shape or form. My Instagram timeline exploded with dark arms, chocolate foundations, brown skin swatches and black women everywhere. They finally woke up! Brands were finally discovering the almighty power of the black dollar and the support it brings. Many brands have insisted that dark skin shades are too “costly” to produce and don’t sell well. Rihanna proved that theory wrong with a single release! In the first week, all of the deep Fenty Beaty shades were sold out and impossibly hard to find. It took a black woman to consider the needs of us all for brands to finally be inclusive. I’m still side eyeing a lot of these brands. But I still somewhat appreciate the effort. Even if it isn’t completely genuine. Because it’s a big step in the right direction. Established brands, like Estee Lauder, has even started taking the steps to be more inclusive. With other brands like NARS, Maybelline and more realizing just how important it is to include us all. Not just the porcelain, beige, medium and tan women of the world. Women of color are a force too! We like to slay, too! We obviously still have a very long way to go in the beauty community. But Rihanna launching Fenty Beauty was one hell of a step in the right direction. The Pro Filt’r Soft Matte Long Wear Foundation isn’t some magical potion in a bottle. It’s the fact that its shade range is incredibly inclusive. Fenty Beauty was made with all women of all shades in mind. And that’s exactly what we need to see in the beauty community!